1. It must be designed to have sufficient gain to drive the deflecting plates. 2. Its gain must be constant for any frequency of the input signal with in the limits of the frequency range specified for the oscilloscope. In other words its band width must be large. 3. Keeping in view of the required stability and band width, it must be an amplifier with fixed gain. The signal handling ability can be improved to the requirements by proper design of the attenuator. 4. The vertical amplifier should not introduce any phase shift, in the signal it is handling. 5. It should not produce distortion of the signal under study. 6. It must be free from spurious responses. Vertical amplifier consists of the following stages. With all the above stages, its fixed overall sensitivity or gain is expressed in terms of the deflection factor, V/div. Fixed gain amplifier will only be used as the design is easier to offer the required standard of stability. When the attenuator is kept in the most sensitive position, the gain of the vertical amplifier corresponds to the lowest reading of the VOLTS/DIV scale of the attenuator. The preamplifier and the phase invertor can be of the plug in type, to cater to the multiplex modes in which a CRO can be operated. The driver amplifier and the output amplifier will be provided in the main frame of the cathode ray oscilloscope. Oscilloscopes with different plug in type units designed for specific measurements are available. They extend the scope of the instrument. The functional block diagram of a vertical amplifier is shown in Figure. The preamplifier uses its first element a FET. The attenuator is isolated from the input of the amplifier by the high input resistance of the FET. An impedance transformer action is done by the FET acting as the first element in the source follower form. Its output impedance is moderate. In some cases to match the source follower to the input of the paraphase amplifier (phase invertor) a BJT may be used as a emitter follower. This again acts as an impedance transformer, to couple the output of the source follower to the input of the paraphase amplifier. A paraphase amplifier is required to drive the output stage which mostly is a push pull stage. Such push pull amplifiers require .equal amplitudes of out of phase voltages as inputs to the two base circuits. To accomplish the. required, signal voltage at the input of the output amplifier the output of the paraphase amplifier must be sufficiently amplified. This is done by the driver amplifier which by virtue of its gain provides the required input voltage to the output amplifier. The push-pull output stage supplies the deflecting voltage to the vertical deflecting plates. The reason for using the push-pull stage is in that it aids the linearity of the deflection of the CR Tube. The vertical amplifier section may use vacuum tubes or transistors. Vacuum tube versions of CROs are out dated now. Excepting the cathode ray tube, now a days the cathode ray oscilloscopes use either transistor version or integrated circuit version. A complete CRO may consist of both transistorised sub-systems as well as ICs. With the introduction of the semi_ conducting devices, the size, weight of the oscilloscope have been reduced considerably. Portable oscilloscopes are now available with smaller screen diameters. The input attenuator consists of number of RC potential dividers controlled on the CRO front panel. This control is done by the VOLTS/DIV selector. This selector will be calibrated in terms of the deflection factor (V/div). The sequence of attenuation commonly used with the CROs is 1-2-5. For example the range of the attenuator setting can be 0.1. 02, 0.5, 1, 2, 5, 10, 20 and 50 volts per division with a maximum attenuation of 50 v/div setting. There are attenuators that have 12 settings. It can also be seen that two capacitors and the two resistors form a bridge as shown in Figure. At balance the product of the resistance and capacitance of RiCi and R1. Cv will he equal. Also at balance there will be no current in branch PQ. Therefore the PQ connection can be omitted from the circuit. Thus the voltage at the amplifiers input is va as given above. As no reactive terms are there in the above expression for the input voltage to the amplifier, the voltage is independent of frequency of the signal. However this is valid only if the bridge is balanced. In other words the attenuator works as a compensated attenuator only when the balance condition is satisfied. To balance the bridge and hence to compensate the attenuator the following procedure is employed. A square wave test signal will be applied to the attenuator input. The waveform obtained on the screen will be continuously observed adjusting the value of Cv. The value of the capacitor will be adjusted until the true waveform of the applied signal is observed on the CRO. If too large a value of Cv is offered over compensation results giving a waveform with over shoot. Too small a value will give under compensation rounding off the corners of the waveform observed. These two effects are noticed when high frequency signal is observed. With overdamping a pure sine wave appears with enhanced amplitude of positive half cycle. Under underdamped conditions the sine wave appears nearer to a rectified voltage waveform with inversion. Therefore the attenuator must be correctly compensated to prevent distortion of the waveform. For the different attenuator settings different RC combinations with the value of C adjusted for proper compensation are used. The selection of the resistances and capacitances of the attenuator are such that the CRO vertical input always presents the same impedance to the circuit under consideration irrespective of the V/div setting. Cathode ray oscilloscopes have input parameters typically of 1 MΩ shunted by capacitance ranging from 20 pF to 35 pF. 1. Amplify and reproduce the input signal. The amplifier must have good fidelity That is it must amplify the input signal within the limits of its bandwidth, without effecting the amplitude, frequency and phase. 2. It has to isolate the cathode ray tube from the input signal. That is it has to act as a buffer. 3. It must have provisions for the different modes of operation. The functional block diagram of the vertical deflecting system of a general purpose oscilloscope is shown in figure. 2. Selector for input signal. 3. Attenuator to adjust the gain of amplifier. 4. The vertical amplifier that amplifies the signal. it connects the vertical amplifier to the circuit in which the waveform is to be observed on CRO. There are many types of probes. The general purpose probe shown in the block diagram above ;as ire probe. This passive probe has a resistor which acts as the attenuator for the signal. The capacitor is to act as the compensator. These two components are used in the probe Tip of the probe connects the circuit. Ground connection is established through a clip connector. The other end of the probe will be connected to the vertical input terminals of the cathode ray oscilloscope using a BNC connector or the like. The input selector is nothing but a single pole three way switch. It's pole is connected to the input terminals of the vertical amplifier. The two extreme positions namely way one and way three are connected to the attenuator through the capacitor and directly, respectively. The middle position of the 'switch that is the second way is connected to earth. In the first position of the switch the input is directly connected to the input attenuator. This position is marked as DC. The d.c input signals will directly appear at the attenuator. In this position both and d.c and a.c components are available after due attenuation at the input of the amplifier. This mode is convenient for measurement of total instantaneous valued of signal voltages. In the third position the input signal passes through a capacitor before it reaches the attenuator. Hence any D.C is blocked. Only the alternating component of the signal will appear at the attenuator. In this mode we can measure alternating voltages superimposed over d.c. While changing the switch from the a.c position to d.c was two connects the attenuator to ground. This discharges any stored charge in the attenuator. Fluorescence is the property of some crystalline materials like phosphor or zinc oxide to emit light when stimulated by light radiation. Phosphorescence is the property of fluorescent materials to continue light emission even after the source that exited is withdrawn. Persistence of the phosphor is the time duration for which the after glow or phosphorescence occurs. The screen of the cathode ray tube is coated with material called phosphor that will emit light when bombarded by electrons. There are many possible phosphors that differ in colour, persistence, efficiency etc. One of the commonest is willemite. This is a composition of zinc orthosilicate, ZnO + SiO2, with traces of manganese as an "activator". This produces the greenish trace of small general purpose cathode ray tubes. Compounds of zinc, cadmium, magnesium, and silicon are the other useful materials for the screens. Presence of metals like silver, manganese, copper and chromium in proportions as small as 1 part in 105 will increase the light output of the screen by a factor 10 to 100 and will also affect the colour. When used these materials are called activators. Phosphors are prepared by grinding, crystallizing, regrinding etc. and are then deposited on the end of the cathode ray tube by settling over of a liquid suspension. The light output of a fluorescent screen is proportional to the number of bombarding electrons that is the beam current and increases approximately as the square of the anode voltage. The spectral distribution of the light depends upon the base material and upon the activator. A great variety of colours is available. The luminance, (light intensity from the screen) depends on the following factors. 1. The number of bombarding electrons, (i.e., beam current) per second. 2. The energy with which the bombarding electron strikes the screen. This is determined by the accelerating potential. 3. 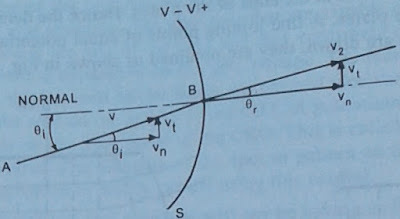 It is a function of the time the beam strikes a given area of phosphor. Hence the sweep speed will affect the luminance. 4. It is a function of the physical characteristics of the phosphor itself. A table showing the characteristics of some of the commonly used phosphors is given below Table. The choice of phosphor for particular application depends on number of factors. p31 phosphor, has high luminance and medium persistence. It is used in general purpose oscilloscopes. General Purpose; replaced by P 31 in most applications. Long decay : observation of low – speed phenomena. General – Purpose; Brightest available phosphor. The deflecting voltage Ed has been assumed as constant in the equation. As the deflection voltage applied to the vertical deflecting plates changes during the transit time of the electrons through the horizontal plates, the deflection sensitivity decreases. Transit time t1 = l/ vox. The upper limiting frequency is defined as that frequency at which the transit time is equal to one quarter of the period of the voltage applied to vertical plates. The frequency range of the oscilloscopes can be increased by making division of the deflecting plates in to several sections in the path of the electron beam. The voltage to be analysed will be applied to the vertical plates through an iterative net work. The propagation time of this iterative net work corresponds to the velocity of electrons there by the voltage applied to the vertical plates synchronises with the velocity of the beam. The frequency response of oscilloscope can be extended up to 500 MHz and above using this method. Two sets of deflecting plates are arranged. One pair is mounted in the vertical plane. This pair produces deflection in the horizontal direction. The other pair mounted in the horizontal plane produces vertical deflection. The deflecting plates are flared to allow the beam to pass the deflecting plates without striking them. 1. Resonant frequency: It is the frequency at which the energy in the cavity attain a maximum value of 2 We or 2 Wm. Wm = Energy stored in the Magnetic field. 2. Quality Factor, Q : It is the measure of frequency selectivity of the cavity. 3. Modes of the Cavity: A given resonator has infinite number of modes and each mode correspondes to a definite frequency. When the frequency of the signal is equal to resonant frequency a maximum amplitude of wave occurs and the energies stored in electric and magnetic fields are equal. The mode having lowest resonant frequency is known as dominant mode. 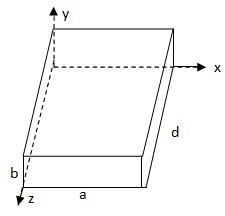 There are 2 modes of propagation possible inside a rectangular cavity resonator. They are TE mode in which electric mode is transverse and TM mode in which magnetic mode is transverse. For TE mode, Ez = 0 and solution may be derived from Hz component. For TM mode, Hz = 0 and solution is derived from Ez Component. The Hz Component is defined by the equation. Microwave Communication in Microwave Engineering refers to the electromagnetic radiation in the frequency range of 1GHz to 300 GHz. The corresponding wavelengths are in the centimetric and millimetric ranges. Microwaves occupy a region in the electromagnetic spectrum that is founded by radio waves on the side of longer wavelengths and the infra-red (IR) waves on the side of shorter wavelengths. Microwave is the region in electromagnetic spectrum in the range between 1 to 300 GHz. The wavelength of microwave range between 30 - 3 cm. Microwave engineering is an important consideration in the development of high resolution radar communication channel etc. 1. High Operating frequency. That is they can carry large amount of information. 2. Short wavelength. Hence Short antennas are used. 3. Easily pass through ionosphere. 4. It can be used for space and satellite communication. 5. Few repeaters are needed. 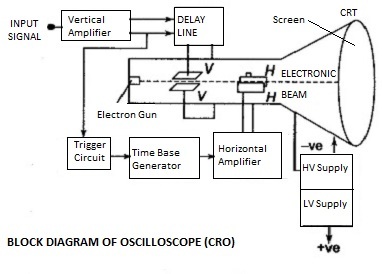 The focusing used in a cathode ray oscilloscope is analogous to the refraction of light beam, through a compound lens system. As light beam can be focused varying the focal length of the system, the electron beam also can be focused on to the screen, to offer a fine spot of illumination. To understand the electronic lens system it is necessary to know the nature of the electro static field lines and the equipotential lines in the CR Tube. Let us consider an electron situated at rest in an electric field. From the definition of electric field intensity we know that the force on a unit positive charge at any point in an electric field is the electric field intensity at that point. The negative sign indicates that the force is acting in a direction opposite to the direction of the electric field. 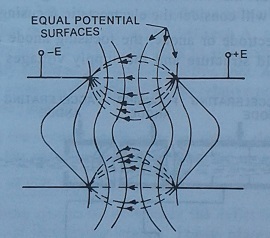 Figure illustrates the electron situated in the electric field. The electric field lines have been shown in figure with directions from positive plate to negative plate. The field lines experience lateral repulsion. This results in spreading of the space between the lines. Therefore the field lines will be curved at the ends of the plates. Hence the density of the field lines will be less at the ends of the plates. A line joining points of equal potentials is called an equipotential line. When such lines are drawn, they are obtained as shown in Figure. As the force on an electron acts in a direction opposite to the direction of the field, it can also be stated that the force on an electron is in the direction normal to the equipotential surfaces or equipotential lines. The following figure illustrates the shape of the equipotential lines between two cylinders placed end to end. θi, is the angle of incidence and θr is the angle of refraction of the electron ray. We find that the equation (5) is identical to the expression relating the refraction of a light beam in geometrical optics. Therefore we conclude saying that the refraction or bending of an electron beam at an equipotential surface is governed by the same laws of refraction of a light beam. This is the reason for calling the electrostatic focusing system as electron lens system. Having established the fact that the refraction or bending of the electron beam follows the laws of refraction of light, we will consider the electrostatic focusing system of the CR Tube. The pre-accelerating electrode or anode, the focusing anode and the accelerating anode are shown along with the grid structure and the supply voltages in the following diagram. In the above diagram we find the pre-accelerating anode, called as A1. It is hollow cylindrical in structure with metal discs placed to make the structure compartmental. There are holes in the metal discs. Electrons will be entering this structure through the hole in the left side. Immediately after this electrode we find the focusing anode. This is a hallow metal cylinder. After the focusing anode we have the accelerating anode called A2. In some constructions the focusing anode may not be there. Anode A1 and Anode A2 are arranged to give the focusing. The pre-accelerating anode A1 and the accelerating anode A2 are connected in common to a high positive potential, supplied by the EHT. The focusing anode is connected to a lower + ve potential. As the focusing anode is negative with respect to the two accelerating anodes A1A2, the electric field lines are non-uniformly placed. The equipotential lines are only shown in the figure. The field distribution and hence the shape of the equipotential surfaces/ lines, can be altered by varying the potential difference between the focusing anode and the two accelerating anodes A1 and A2. As shown in the figure the potentiometer connected in the potential divider network that supplies voltage to the electrodes does this job of varying the voltage and hence is called the focus control. This control is made available on the front panel of the CRO as a user control. Varying this voltage changes the focal length of the electron lens. Therefore the beam of electrons can be accurately focused on the screen by proper adjustment of the voltage on the focusing anode. The electron beam on entering the pre-accelerating anode will be under the influence of a high positive potential the electrons will be accelerated towards the screen. The discs with centrally located holes aid their travel in the form of a beam. However some electrons will be attracted by the pre-accelerating anode, that contribute the A1 current. The electrons being negative charges repel each other. Therefore we will not get a close beam of electrons. Right from the grid they travel in a diverging beam pass through the pre-accelerating anode with increased velocities and encounter the electric field between the focusing anode and the anode A1, As their paths are not normal to the equipotential lines (surfaces) the electrons undergo refraction through the electric field between the anode A1 and the focusing electrode. Later again they encounter the electric field between the focusing anode and the second anode while they travel towards the screen. The high voltage accelerates them and at the same time due to the electric field distribution they are again refracted through the field. Thus the electrons undergo refraction through the double concave lens system. The result is that they enter the region between A1 and focusing electrode with an inclination, travel parallel to the axis of the CR Tube in side focusing electrode structure latter undergo refraction and finally arrive on the screen as a fine spot. As mentioned earlier the size of the spot (beam) striking the screen is determined by the relative potential difference between A1, A2 and the focusing electrode (anode). It must be noted that the second anode may not attract electrons due to their velocities. The A2 current is mostly by the secondary electrons from the screen. 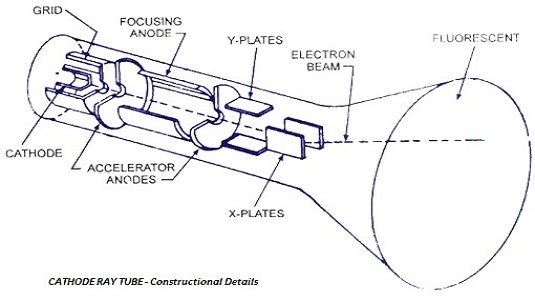 The constructional details of a general purpose CRT are shown in Figure. It consists of the electron gun, deflecting system, fluorescent screen and the housing which is a funnel shaped glass envelope with a base. The electron gun : This assembly consists of an indirectly heated cathode and a grid struc-ure the anodes that deflect and focus the beam. The cathode is surrounded by the grid. The grid s a nickel cylinder. It has a small hole in the centre and is located coaxially with the tube axis. The cathode emits the electrons. The grid is maintained at a negative potential with respect to the cathode. Under the influence of the grid the electrons are prevented from diverging and they pass through the hole in the grid structure. The electrons that are capable of passing through the grid structure's hole travel along the axis of the tube and they contribute the beam current. 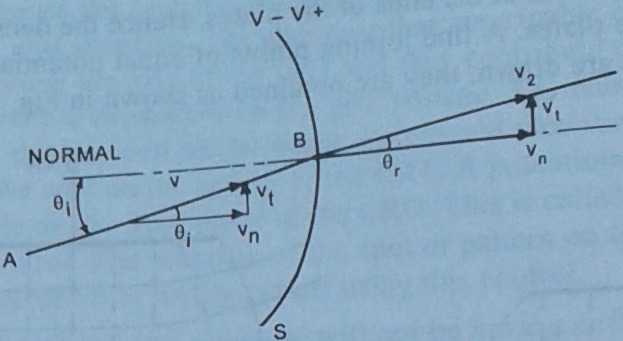 The magnitude of this beam current is dependent on the grid voltage. The more negative the grid is with respect to the cathode, the less will be the beam current and vice versa. The beam current determines the intensity of the spot on the screen of the CRT. A potentiometer that controls this grid voltage is made available on the front panel of the CRO. This is called the intensity control. Intensity control is a user control. The intensity of the spot or pattern on the screen of the CRO can either be increased or decreased or totally cut off using this control. The electrons after passing the grid structure will not be having sufficient velocities to reach the screen. Hence they are to be accelerated. It is for that purpose an accelerating electrode called the preaccelerating electrode and another accelerating anode called the second anode are used. As the beam contains electrons that repel each other, the beam tends to diverge. To prevent this and to arrive at a fine beam that would result in a fine spot on the screen of the CRT, a focusing electrode is introduced between the preaccelerating anode and the second anode. Some cathode ray tubes will not be provided with a separate structure for the second anode. Instead of the second anode, a conductive layer will be formed inside the glass envelope which is used as the second anode by applying positive potential. The process of converging the electrons in to a fine form of beam using the anodes is called focusing. Electro static focusing is used in CROs.